Early in 2011 the club was planning our big event for that year. It was realised that this event must offer something different to the many vintage rallies around the country. It was decided to run a harvest working day and vintage rally. This was an easy decision due to the fact that quite a number of reaper and binders and vintage combine harvesters were restored and maintained in full working order in the locality. Club member Jim O’Regan from Barrells Cross near Kinsale immediately offered the use of his land and a portion of his winter barley crop for the event. As the summer progressed the ripening barley was watched closely in anticipation of the upcoming harvest day. Finally Bank Holiday Monday 1st August arrived and what a line-up of machines we had working in the field. 1930’s Reaper and binder owned by Eddy O’Neill. Originally a horse drawn machine and Pulled by Con Keoghane’s 1962 MF 35. 1955 Claas Super Junior trailer combine with a 1963 Super Major owned by John O’Neill . 1959 Dania D500 Trailer combine with 1973 Ford 4000 owned by Edward Draper. 1965 Dania D600 Trailer combine with 1955 David Brown 30D owned by John Quinn. 1966 Massey Ferguson 30 Tanker combine owned by Martin O’Sullivan. This machine was german built with a vw engine, has no Hydraulics and a cut of 5ft. 1968 Clayson 135 10ft cut owned by James Collins. 1970 Clayson 133 10ft cut owned by Alfie Kingson, driven by David O’Neill. In the background towering over these vintage machines was the O’Regans 2008 New Holland CX8090 4WD combine harvester with a 24ft cut. The action kicked off with the reaper and binder moving into the crop of barley and throwing out neat sheaves as it progressed along the field. As this was happening the Threshing crew set about lining up John O’Neills, 1920’s Ransomes thresher with his 1959 McCormick B450 Tractor. The sheaves were gathered up in preparation for the threshing. One by one the combines lined up and took turns to cut a line of barley. As each combine completed a run, tractors with vintage bailers took their place to gather the straw up into square and round bales. Jim Moore had a Vicon Lely hay rake on his MF35. John O Sullivan had a Massey Harris bailer. This bailer produces a square bale and is unusual because it is powered by its own mounted petrol engine and the bale is made on edge. Michael Hannon 1960’s Allis Chalmers bailer pulled by his David Brown 996 produced small round bales. Gerry O’Neill had his Claas 65 bailer with a Ford 7600. When the harvesting was done and all the bales and sheaves cleared the local vintage ploughmen took over. There was a fine display of ploughs, harrows and planting machines. 1963 MF 35X with a pierce two furrow plough owned by Sean Ryan. 1958 MF35 petrol with a Ransomes TS 59 plough owned by John Wolfe. 1969 MF165 with spring harrow owned by Martin Nyhan. 1970 MF 135 with multiplex harrow owned by Jimmy Nyhan. 1972 ploughmaster and roller owned by Denis O’Reilly. 1950’s Pierce Star Corndrill owned by John Wolfe pulled by Edward O’Neills 1967 David Brown 1200. 1950 David Brown Cropmaster with ridge plough owned by Martin O’Regan. The Rocket was invented by local man Gerry Murphy in the 1950’s and manufactured in Bandon by Hartes Ltd.(see leaflet). While the tilling was taking place the sheaves were delivered to the threshing team. The thresher was put into action and grain started flowed into the waiting sacks. Alongside the working machinery there was a static display of vintage cars, tractors, commercials and motorcycles . Local musicians and dancers performed traditional set dancing. The coastguard set up and operated rescue equipment from the 1860’s. Other working exhibits included a winnowing machine, blocksplitter and the stationery engines added their unique sound to the hum of the combines in the working arena. Spurred on by the success of the first harvest day , the club committee met and agreed to run a similar event on the August Bank Holiday Monday 2012. 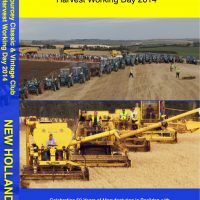 The Harvest working day last year surpassed all expectations. It was twice the size of the first event. Stars of that year’s show were John O’Neills recently restored Claas Super (one of the first batch of four to be imported into Ireland in 1950 by Atkins of Cork) and an immaculate one hundred year old Clayton Shuttleworth Thresher bought new in the area in 1912. This year is the year of the gathering in Ireland. 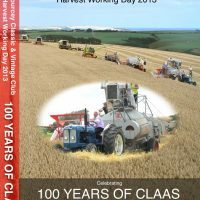 This year is also the centenary of the Claas agricultural machinery company. 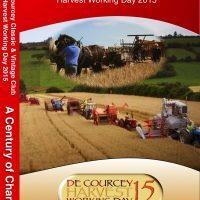 DeCourcey vintage and Classic club in partnership with Claas will celebrate these two momentous occasions with a Harvest Working day extravaganza on Mon 5th August 2013. This event will once again be held at Coolyrahilly, Barrells Cross, Kinsale Co. Cork on the lands of Jim O Regan. This event builds on the success of the clubs previous Harvest events. The focus will be on working equipment but there will also be a large static display of vintage machines. Visitors will have the chance to see old combines from harvests of the past working the land as they have done for decades. Reaper and binders, trailer combines and horse drawn implements used by our fathers and grandfathers will be in action once again. Expect to see Claas low density balers, Claas super 1950 and super junior 1955 combines as well as Claas SF, Europa, Columbus and matador combines. Claas will display a range of equipment to include senator, dominator and the lexion range. Claas merchandise will also be available on the day, there will be unique prizes to be won in our raffle and an auction of Claas products. Funds raised by this event will be donated to the Children’s leukaemia unit Mercy Hospital Cork and local charities.